I’ve long been a sucker for the old classic salad, Shrimp Louis. It is one of my favorites, but almost nobody makes it anymore. If they do, they disgrace the salad with bottled french dressing. It is a sad state of affairs! A classic Shrimp Louis is simple, clean, elegant, and a little spicy. Think creamy cocktail sauce dressing a salad of greens garnished with generously sized shrimp or other shellfish. Sometimes there are cucumbers, celery, or green peppers involved, sometimes not. We recently visited the coast, which always gives me a powerful craving for seafood. The menu for episode #74 was well balanced with the smoky steak the steak and deluxe potato stuffed mushrooms, yet it was a little deficient as far as vegetables are concerned. So, a nice crisp salad was the perfect addition to fill out the menu. Squeeze the lemon onto the onion and garlic. If a mellower flavor is desired, let it soak for 30 minutes. Steam the shrimp gently until fully cooked. Peel and devien as needed, you can do this before or after cooking. Rinse the shrimp well with cool water and chill completely. Stir the onion, garlic, mayo, lemon, chili sauce, mustard, parsley, and salt together. Toss the greens in a light coating of dressing, reserving at least half. 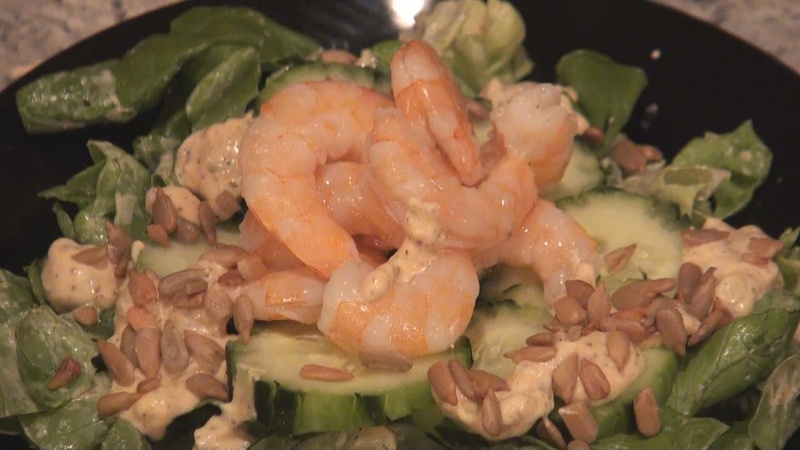 Plate the greens, top with the cucumbers, then the chilled shrimp. Spoon the remaining dressing over the salads and garnish with sunflower seeds. We hope that you enjoy this salad. It is a charming complement to the coffee rubbed steak and the potato stuffed mushrooms!